If you’ve sensed a disturbance in ‘the force,’ it’s coming from a seaside community just outside of Halifax, where a backyard inventor has created something out of this world. 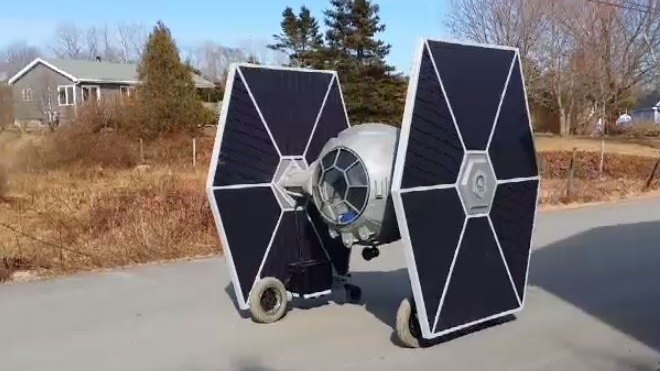 Allan Carver used steel, wheelchair parts, welding skills, and a large dose of imagination, to build one of Star Wars most iconic vehicle – the TIE fighter. Many fans know the TIE fighter as the symbol of the Imperial fleet. “When you’re 10 and watching the big screen it’s just dang cool,” says Carver. The lifelong Star Wars fan built the vehicle at his home in Queensland, and his 12-year-old son, Kyle, is the lucky rebel who gets to pilot the remote control. Carver powdered his creation with a clever source, and a welding lesson from YouTube. He went to work last December, using a combination of steel and hard foam to re-create the Imperial Fleet’s single pilot vehicle. Carver says he didn’t keep track of the hours he put into his project, because he simply doesn’t want to know. He says the biggest challenge was perfecting the scale of the model. Carver’s son, Kyle, says his friends are genuinely impressed by his father’s creativity. Kyle has already put a bug in his father’s ear about their next project. “That’ll blow lots of people’s minds,” adds Kyle. There’s no doubt it will, but what does Carver’s wife and Kyle’s mom think about all this? Carver promises he won’t give into the Dark Side, because ‘the force’ is strong at his workshop in Queensland, Nova Scotia.